In Singapore for the F1? In between watching the Night Race and Kylie here’s Chopstix’s pick of the best restaurants near the race track. A long time darling of Singa’s fine dining scene, Saint Pierre has recently moved to a new location in one of the Fullerton heritage buildings overlooking the Marina in the CBD. Chef Emmanuel Stroobant’s fancy fare sits better in this table clothed, chandeliered setting though the vibe is modern rather than stuffy. Stroobant combines French techniques with tip top Japanese ingredients with wonderful results. The service is top notch too. Tasting menu only for dinner ( choose between six or ten courses, meat or vegetarian) plus a spectacular French cheese cart and a petit fours trolley. 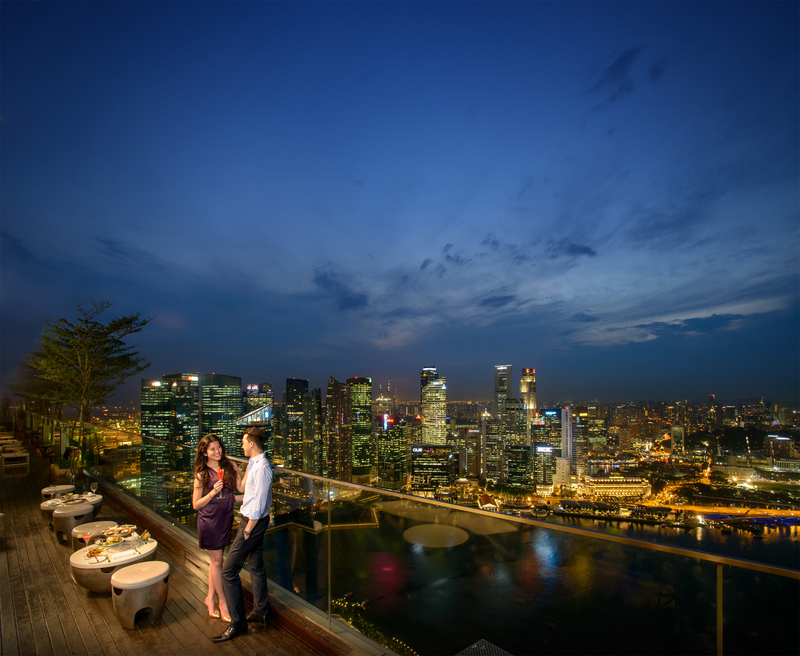 Around 7pm you’ll catch the jaw dropping sunset reflected in the Marina Bay Sands spectacular across the bay. Restaurants with a knock out view usually don’t bode well on the food front but that’s not the case with Jaan. Although the 70th floor vista of central Singapore will impress even the most spoilt and/or jaded traveller, the cuisine – and the service, also match it. All tables at this compact restaurant are cleverly set up to enjoy the outlook overlooking the river, marina and beyond to the Straits sea. The kitchen is in good hands with Kirk Westaway the long time sous promoted to head chef whose notched up a Michelin star. Food-wise we’re talking tasting menu only at dinner. Expect high end French with contemporary twists and trickery that elicit lots of smiles and admiring “aahs”. 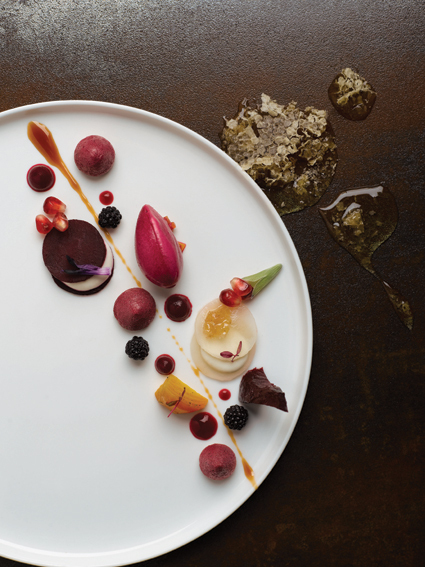 First comes a plinth of amuse bouches that looks like a work of art. Then a 55 degree cooked egg is cracked and poured into a dish before you in a cute nod to Singaporean coffee shops way of serving soft boiled eggs. This menu-less, omakase (“I’ll leave the choice up to you”) restaurant has caused quite a stir in Singapore and has been awarded a Michelin star in the city state’s inaugural Michelin Guide. It’s the brainchild of renowned Tokyo chef Shinji Kanesaka, as the name suggests. In Singapore, a team of Japanese chefs work under the watchful eye of master chef Koichiro Oshino who has been with Shinji for over 20 years. 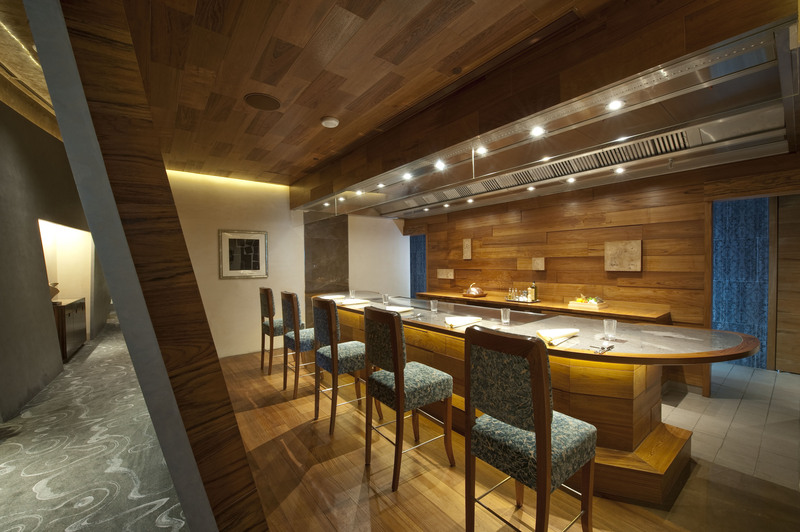 They work behind a wooden counter carved in a single piece from a 220 year old hinoki or Japanese Cypress tree which is as stunning as the food they prepare. Only fish and seafood is served but not just sushi and sashimi there’s plenty of grilled dishes too including 5-hour steamed Hokkaido abalone. This is Sydney-based chef Tetsuya Wakuda’s first foray outside of Australia and is an extremely hot ticket in Singapore – especially since it zoomed into the World’s 50 Best Restaurants list in 2012. The restaurant has since earned a Michelin star. To start is raw seafood, maybe sea urchin and abalone, followed by “salads” such as scallops with daikon and oyster. 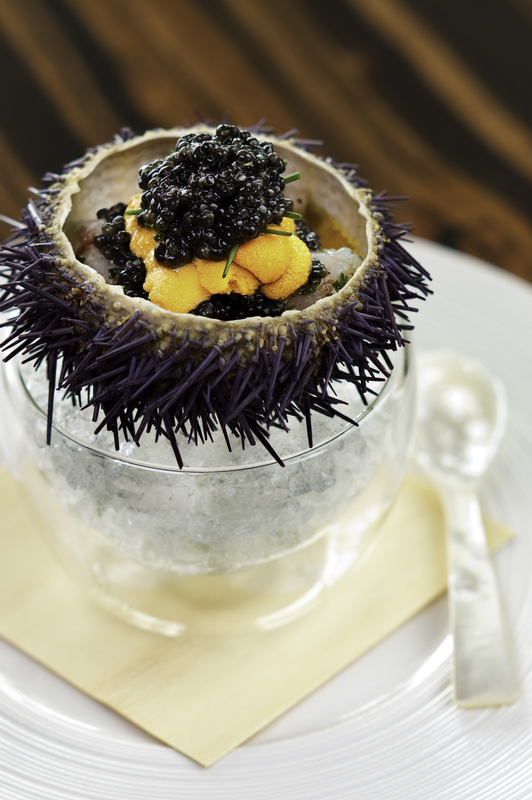 Standout dish is the marinated shrimp with sea urchin and caviar. The the real magic begins as your private chef cooks a succession of fish and meat dishes such as crab legs steamed on a salt bed and wagyu beef with grated wasabi. It’s part theatre, part cooking lesson. Local enfant terrible Justin Quek trained with some of the best chefs in France and now mixes Singaporean Chinese flavours with classical French techniques and vice versa. His impressive menu includes foie gras braised in soy sauce in the same style as Teochew braised duck and xiao long bao filled with foie gras and truffle consomee. A particular triumph is JQ’s Beef Broth with Braised Tendon, Ribs & Slices of Wagyu. The chef says it’s inspired by Singaporeans eating Beef Noodles at hawker stalls at the end of a night out to avoid a hangover the next day. His version comes with a shot of Jack Daniel’s added. There’s always a gathering outside Osteria Mozza of those without the foresight to book ahead at this popular Mario Batali outpost. 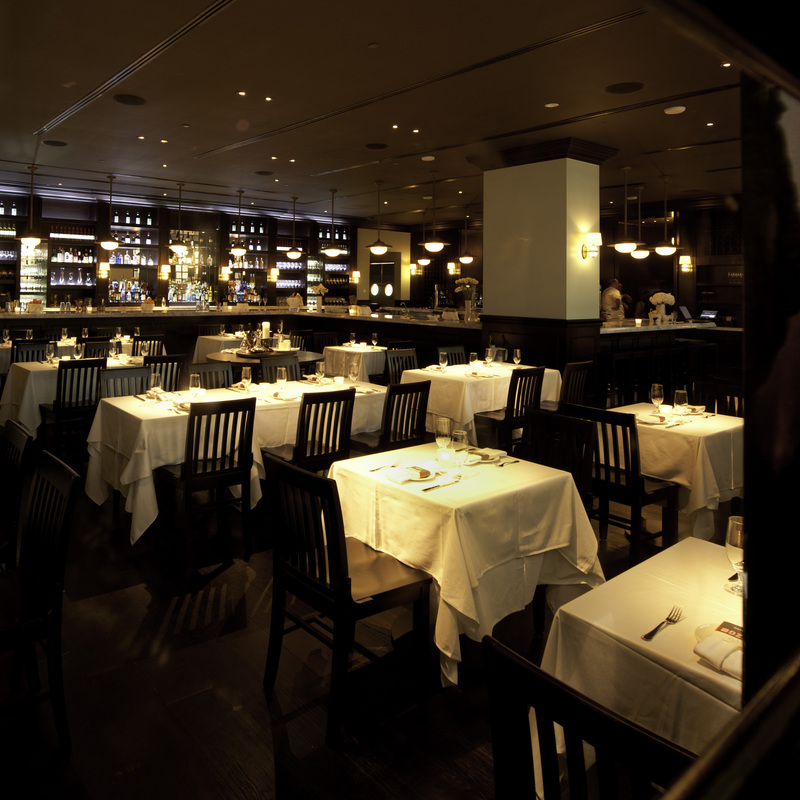 Inside, the dark wood, white table cloths and sizeable bar transports diners from Marina Bay Sands mall to New York. 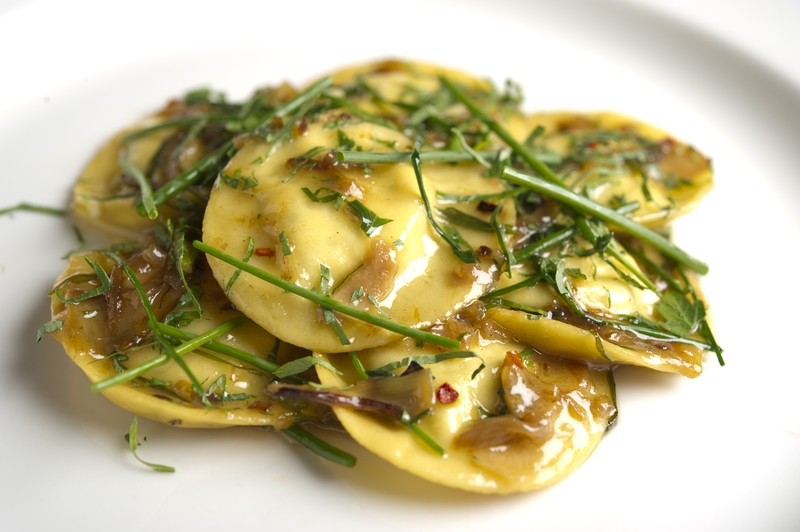 Batali’s trademark rock soundtrack adds a convivial atmosphere but never detracts from the attentive, friendly service. Under the helm of executive chef, David Almany, the menu is Italian American boasting half a page of mozzarella and a full page of pasta as well as exemplary antipasti, meat, fish and of course, dolce. There’s also a great selection of Italian wines, thanks to co owner Joe Bastianich. If you can’t get a seat here, Batali’s other joint next door does the best pizza in Singapore.